Make this warm, soothing bowl of rice cake soup with dumplings for your New Year celebration! It’s also a great comfort food any time of year. 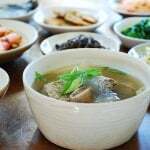 The recipe shows how to make a quick Korean beef broth, but use any broth/stock you prefer. Happy Lunar New Year! Tomorrow is Lunar New Year (Seollal, 설날)! 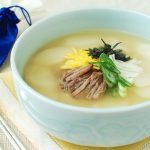 Although we eat tteokguk all year round, tteokguk is a traditional New Year dish. 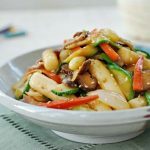 I already have two versions of tteokguk on the blog – tteokguk and gul tteokguk (oyster rice cake). 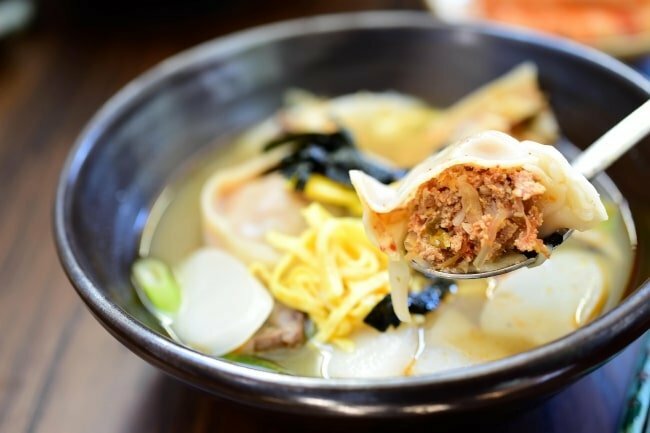 This time, I’m showing you how to make a variation made with mandu (Korean dumplings), hence the name tteok mandu guk (떡만두국)! My previous tteokguk recipe uses beef brisket which is flavorful but takes a long time to cook. 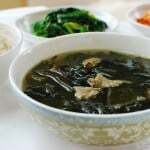 In this recipe, I used a quick method to make a beef soup base. You can also use anchovy broth, vegetable broth or even store-bought chicken stock, if preferred. For dumplings, I personally prefer kimchi mandu for the soup. 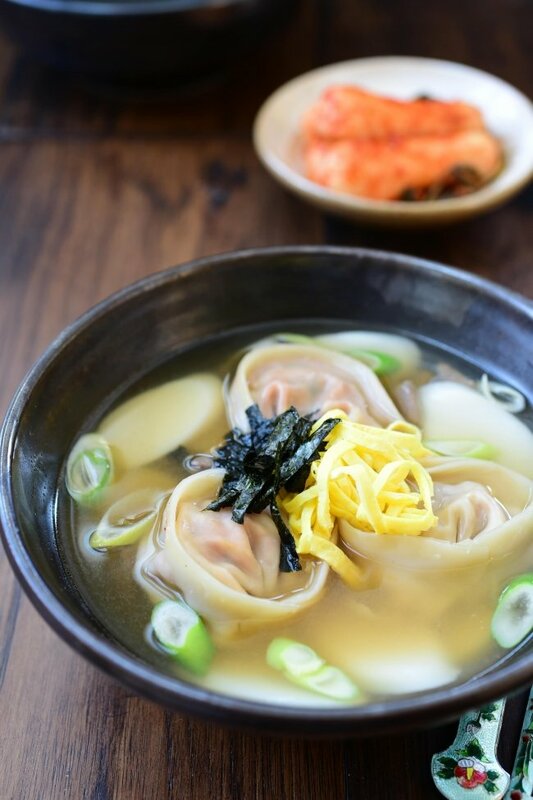 The robust flavor and crunchy texture of kimchi mandu add a nice contrast to the mildly flavored broth and soft rice cake slices. You can, of course, use any dumplings, including your favorite store bought ones. To add mandu (dumplings), you can cook them in the broth along with the rice cake slices. Stir gently so they don’t stick to the bottom of the pot. Boil until all of them float to the top. But, this method will make the soup pretty thick from all the starch released from the rice cakes and dumplings. 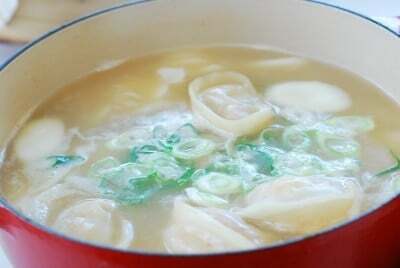 One way to keep the soup from becoming too thick is to cook the dumplings separately in boiling water until they float, and add to the soup after the rice cakes are softened. I prefer steaming the dumplings and adding to the soup at the end. This not only keeps the soup from getting too thick, but holds the dumpling skins nice and chewy. Happy Lunar New Year! 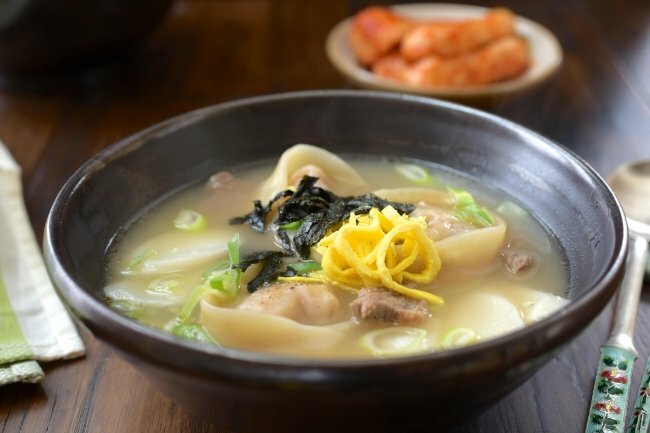 Hope you and your family have a delicious tteok mandu guk. 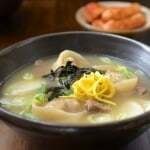 Have you tried this rice cake soup with dumplings recipe? Please rate the recipe below by either clicking the stars in the recipe card or in the comment section! And make sure to share your creations by tagging me on Instagram! Stay in touch by following me on Pinterest, Twitter, Facebook, and Instagram. Make this warm, soothing bowl of rice cake soup with dumplings for your New Year celebration! 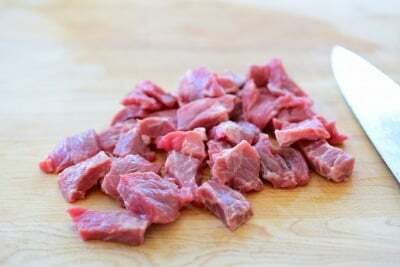 Cut the beef into thin bite size pieces (1 to 1 1/2 inch). 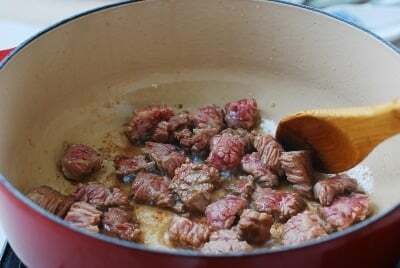 In a medium pot, sauté the beef with 1 tablespoon of soup soy sauce until all the pieces turn brown. Pour in 5 cups of water and bring it to a boil. Skim off the foam. Reduce the heat to medium and continue to boil, covered, for 10 minutes. You can add the dumplings to the soup along with rice cakes in the next step. 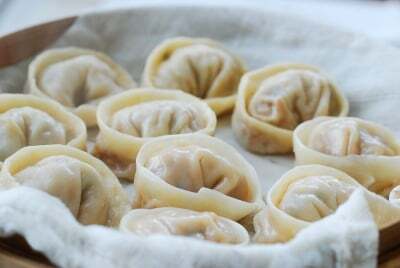 Another option is to cook the dumplings separately in the boiling water until the dumplings float to the top, and then add to the soup when the rice cakes are cooked. 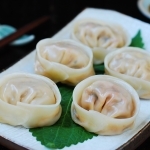 Or, line a steamer with a wet cheesecloth and then steam mandu for about 8 minutes (10 minutes if frozen). Add the garlic and the rice cake slices to the boiling broth. 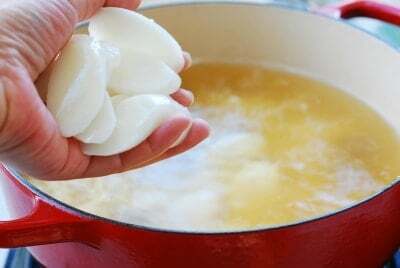 Boil until the rice cakes turn very soft, usually about 5 – 8 minutes. Drop the cooked dumplings and the scallion to the soup. Let the soup come to a boil again. Season with salt and pepper to taste. Ladle the steaming soup into individual bowls and garnish with the optional egg and gim strips. Roll each egg crepe, and slice into short thin strips. Slice the scallion diagonally into thin strips. Roast the gim on a hot skillet. Cut into thin 1 1/2-inch strips with kitchen shears, or simply crush them with hands. Tastes just like the restaurant ! Bravo !